As any Australian will know, nothing says 'weekend getaway' better than with a fleeting visit to pristine Byron Bay. Indulging in everything this alluring-boho town has to offer, it will leave you feeling like you're in a romantic infinite world of endless summer. When a classic red is far too bold or your bright berry and show-stopping pinks are way too overrated, you will find the shimmery Byron Bliss is bang on trend and hotter than the sun! 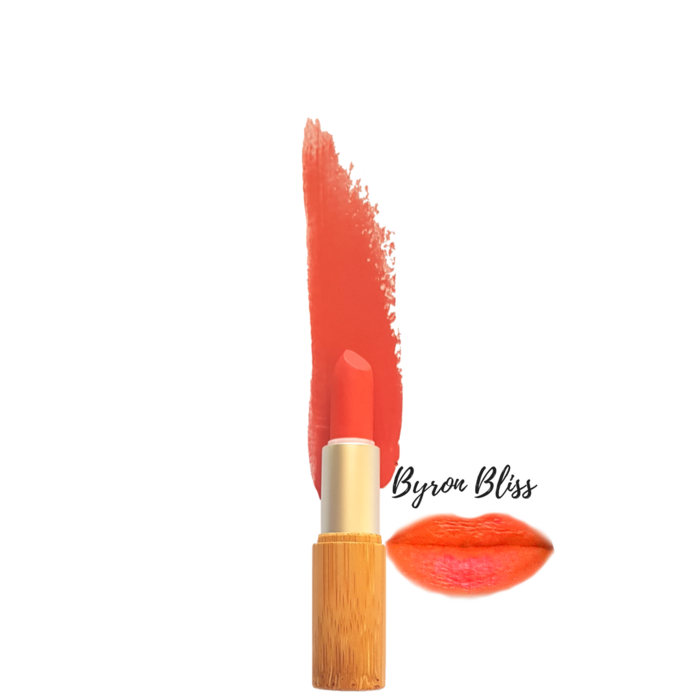 'Byron Bliss' is a bright peachy coral orange with pink undertones married with a weightless buttery texture to replenish your pout. This shade looks flawless against sun-kissed skin, although those with delicate fair complexions can also rock this baby to the moon and back. Gorgeously infused with naturally derived certified organic fruit oils to provide a subtle yet fruity fresh scent and encased in it's super cool bamboo tube. Dreamy creamy with a shimmy shimmy shake (that never cakes), mega-moisturising and lasts well like those hot summer feels. Made in Australia, vegan and certainly not tested on any animals. Please note these lipsticks contain nut oils and waxes. Do not use on or around those with nut allergies. May contain: Sweet Almond Oil (Prunus Amygdalus Dulcis), Apricot Kernel Oil (Prunus Armeniaca), Castor Oil (Ricinus communis), Meadowfoam Seed Oil (Limnanthes Alba), Macadamia Oil (Macadamia ternifolia), Candelilla Wax (Euphorbia Cerifera), Macadamia Wax (Macadamia Integrifolia), Mango Seed Butter (Mangifera Indica), Shea Butter (Butyrospermum parkii), Cacao Butter (Theobroma cacao), Avocado Oil (Persea gratissima), Mineral Mica (lip safe cosmetic grade), Iron Oxide (lip safe cosmetic grade), Titanium Dioxide, Zinc Oxide, Kaolin Clay, Natural Organic Fruit Flavour Oil. Colour disclaimer: We endeavour to depict as close to the true colour as possible. However, please keep in mind that due to the differentiation between screens and the variation in natural lighting, actual colours may vary slightly from the images you see here. Feel free to get in touch with any questions about the colour of any lipstick before purchasing. Recycle (please): Once you have used your lipstick, please clean out the empty tube as best you can and drop/send it in to your local Biome store who will pop it in their TerraCycle bins and have it sent off for specialist recycling. TerraCycle is changing the way we recycle by sorting out all those ‘hard to know what to do with items’ such as pens, toothpaste tubes and great news for us….cosmetic packaging! If paying by Bank Deposit please leave your name as a reference.